Combining 8-bit-style graphics and a mysterious foreign planet, Space Age by Big Bucket offers players an opportunity to explore a new world while trying to solve puzzles and find a way home. 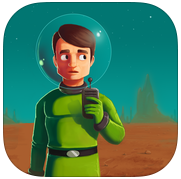 Set in 1976, the game follows a small band of interplanetary explorers who are exploring Kepler-16. On the planet, they find a variety of alien life forms, including plants and insects, but no intelligent life. Or so they assume. Navigate a map to accomplish missions, move back in time to learn more about how the characters came to be on Kepler-16, and try to solve the mysteries of this alien environment. This game gives you control over a variety of characters and an opportunity to explore a planet with only small segments of the landscape revealed at a time. The game alternates between exploration, puzzles, and characters’ interactions, which can range from fighting to conversing. The levels vary significantly so that some are easy to complete and others are more challenging, which I found made the game more engaging and kept it from being too short. Though I played Space Age on an iPad, it is also available for iPhones and I think that it would translate well to the smaller screen, though the images are more impressive when larger. Space Age will appeal to video gamers who fondly recall 8-bit arcade games from their childhood, but it will also appeal to teens and tweens who like games that bring together appealing artwork and compelling storytelling to create an immersive experience. The puzzles will challenge even those who play a lot of mobile games, though the app remains approachable for those who are not dedicated gamers. Unlike many mobile games, I feel that Space Age manages to carefully walk this line between “serious” and “casual” gamers, in a way that I think will make this a popular game. If all of this intrigues you, you can learn more about the game by watching the trailer below. Tagged app of the week, apps for teens, Space Age.